A guide to writing grant proposals tailored specifically to a donor?s interests, complete with step-by-step instructions and samples of winning proposals. In grant- seeking, words can go where the applicant can?t?the foundation boardroom, the corporation?s headquarters?so it?s important to use them as the strategic, powerful tools that they are. This book shows readers how to find, frame, and use words effectively to make the case for any organization and its projects. Koch shows readers how to write with a point of view that is geared to the funder?s interests and goals, while remaining true to the project. 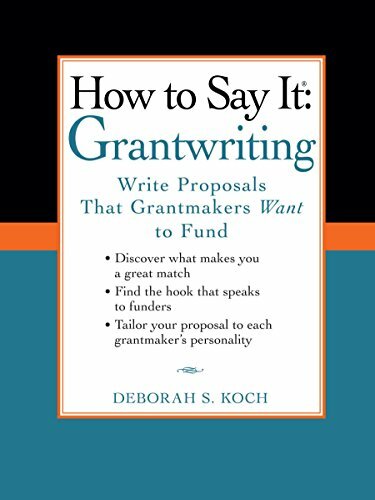 Packed with examples of winning proposals, and strategies for using words to inspire and convince, this is the must-have resource for any grant-seeker hoping to stand apart from the crowd. If you have any questions about this product by Prentice Hall Press, contact us by completing and submitting the form below. If you are looking for a specif part number, please include it with your message.